FOUNTAIN HILLS, Ariz. — If words like UFO, extraterrestrial, crops circles and abductee have ever piqued your paranormal interest, do yourself a favor and head to the International UFO Congress. 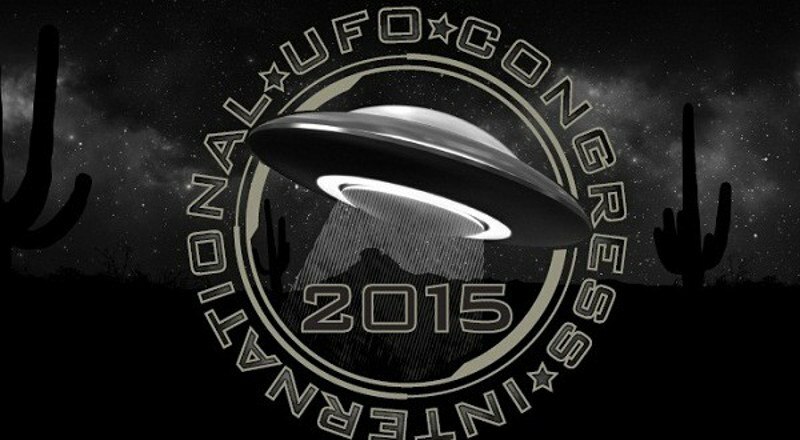 The annual conference—which holds the Guinness record for being the largest convention dedicated to unidentified flying objects—takes place in the picturesque desert town of Fountain Hills, and this year it ran from Feb. 18 to 22. It’s worth noting that Arizona is known as a hotbed of activity when it comes to sightings. Thousands flock to the annual event, which is produced by Open Minds, a paranormal research organization. Each attendee has his or her own reason for being there. My goal was to find out if modern science and technology have changed the game when it comes to UFO sightings and evidence gathering. “A lot of people think, go to a UFO convention, it’s going to be tinfoil hats, but that’s not what this is. We have NASA astrobiologists speak, scientists, high-ranking military officials, the works. I mean, there’s a lot of really credible people covering this subject,” said UFO Congress co-organizer and paranormal journalist Maureen Elsberry. When attending a UFO conference, the best approach is to come in with an open mind, ask lots of questions and talk with people about why they are there. Everyone has a story, from the speakers to the attendees, and even the vendors (some of whom double as ufologists). The highlight of this year’s conference was undeniably the speaker series, and it was standing room only to see one man, Bob Lazar. Lazar first spoke out in 1989, claiming that he’d worked as a government scientist at a secret mountainside facility south of Area 51’s main site, where he saw remarkably advanced UFO technology. Critics have sought to discredit Lazar, questioning his employment record and educational credentials. During the conference, George Knapp, an investigative TV reporter in Las Vegas who broke the Lazar story in ’89, led an onstage question-and-answer session with Lazar, who discussed the work he did at a place called S4. Lazar spoke in detail about the alien UFO hangars and UFO propulsion systems he was allegedly asked to reverse engineer, and even loosely sketched them out for the audience. “All the science fiction had become reality,” said Lazar, who was noticeably uncomfortable and clearly surprised by the fact that, decades later, he remains such a draw. Many of the attendees told me that hard evidence is a requirement for ufologists and paranormal field experts. Derrel Sims, also known as Alien Hunter, told me he spent two years in the CIA, and also has served as a police officer and licensed private investigator. He said his first alien encounter happened at age 4, and others in his family have also seen aliens. In 38-plus years of alien research, Sims has learned this: “If you look, the evidence is there.” To date, he said, more than 4,000 pieces of that evidence exist. Sims is adamant about only working with evidence-based methods, using DNA tests and collecting samples as well as relying on ultraviolet, infrared and x-ray tools in his research. He said that, in 1992, he discovered aliens leave their own kind of fluorescent fingerprint, and he continues to test for these clues. He added that if you have had an alien encounter, it’s important to react quickly to gather evidence: “fluorescence” stays on the skin for only 24 hours. He said that other marks aliens leave include “scoop” marks, which are an identifying thread some abductees have in common. Another commonality he’s discovered is heritage. He said that, in his research, he has found 45 percent of all abductions happen to Native Americans, Irish and Celtic people, and he said that women also have a higher chance of being abducted. When it comes to filming hard-to-explain phenomena, Patty Greer, who makes documentaries about crop circles, said that quadcopters — a.k.a. drones — have added production value to her films. Lynne Kitei, who covered a mass UFO sighting in her book and in the documentary The Phoenix Lights, said that even low-tech tools, like the 35mm film she used, are still a reliable way to gather proof of inexplicable flying craft, especially because they offer something an iPhone doesn’t: negatives. Night vision also offers added opportunities for UFO researchers, according to Ben Hansen, who was the host and lead investigator of SyFy channel’s “Fact or Faked: Paranormal Files.” He’s now the owner of Night Vision Ops, an online store that sells night-vision technology. Hansen said that the consumer accessibility of new military-grade technologies in thermal and light amplification scopes are upping the game for the everyday UFO enthusiast. To close out an intense few days on site at the Congress, Hansen’s team invited me to a night watch near Arizona’s Superstition Mountains. It was fascinating to see the latest optics add incredible clarity to the night sky, amplifying available light up to 50,000 times beyond what the unaided eye can see. Using the right technology, we were also able to see that a certain flying object, which made everyone nearby jump, wasn’t a UFO after all. It was a bat. I was surrounded by some serious tech all weekend, and it was eye-opening to see the ways that UFO hunters are gathering scientific evidence to learn more about the paranormal world. But I have to say, the gadget that was the most useful to me at the conference was my iPhone, which I used to download a free nightlight app for kids. For the few hours I managed to sleep, it was with the soothing illumination provided by “Kiwi the Green Koala.” In short, I was officially freaked out.